The flavor of the season is back at your local Yogurtini . We love indulging in this winter-time treat as the holiday season approaches. Originating in Europe as a drink to celebrate prosperity and good cheer, it has become an American family holiday staple. This creamy frozen yogurt base can be paired with all your favorite holiday toppings for a unique creation. Try a swirl topped with graham cracker crumbs, cheesecake bites, chocolate chips and a caramel drizzle. Or stay classic with a fresh raspberry topped swirl, simple and satisfying! This holiday season we invite you to grab a cup, swirl to your heart’s content and rediscover the holiday spirit with a past favorite flavor. 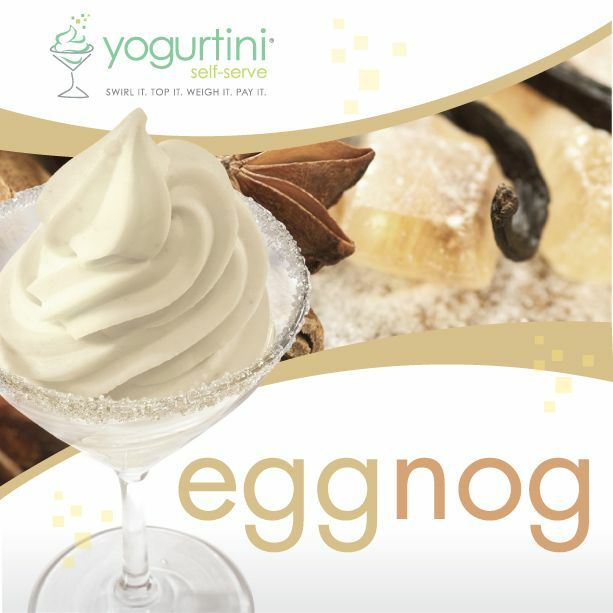 Eggnog froyo is now swirling at participating Yogurtini locations.